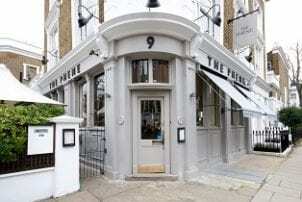 The Phene pub is a hidden gem, set back from the hustle and bustle of the famous King’s Road and the beautiful Prince Albert Bridge over the Thames. The pub houses a relaxing bar with fireplace and welcoming ambiance that leads to 2 dining areas, the Conservatory and the Aviary, both designed in different styles to suit all tastes, as well to our piece de resistance, our beautiful covered garden. Grab a pre dinner drink from our drinks list featuring an extensive and varied wine list, unique cocktails, and large spirit list, or grab a table and settle in for an evening of drinks and light bites. The Conservatory is a light and airy space, styled with modern and elegantly quirky features and fabrics. Should you wish to have a dinner party for up to 22 this is the ideal space. With giant antique glass lamps, comfortable fuchsia armchairs and our signature wallpaper, the Conservatory is an elegant relaxed dining space. Located next to garden on the ground floor of the Phene, we suggest booking the Aviary for standing drinks parties of 30 or it can also accommodate dining for up to 16. Its informal nature is best suited to occasions that require atmosphere of the bar but with plenty of room for your guests to mingle. Providing respite from city living, our Garden is the perfect urban escape. With our giant umbrellas, blankets and heat lamps its the perfect spot to while away the hours. Our garden is mostly undercover and fully heated so you’ll be sheltered if the weather is unkind. You can hire half the garden for summer drink and canape receptions, for up to 50 people. This can be hired out alongside the reservation of our private room the Oakley Room. Located on the first floor, just a flight of stairs away from our garden, is the Oakley Room. This light and spacious room has it’s own bar, making it perfect for drinks parties of up to 70 people or sit down dinners of up to 36 people. It is the perfect room for a home away from home feel, with it’s elegant and comfortable furnishings, set off by a beautiful mirrored wall with hanging lanterns for that magical touch. Our menus are designed with the finest British produce to satisfy a wide range of tastes. The wide selection of bites on our Canapé menu allows you to choose what’s most suitable for your party, or try a more informal evening, with our sharing boards catering to all tastes. Our experienced events team is here to take the stress and the work out of arranging your party this year. We’ll go through everything step by step to ensure you have a great time with us. Book this venue or let us help you find more perfect Venues in South West London for your event.